LONDON, Jan. 23 — Troops of Uganda's army mutinied today, and British troops were flown in from Kenya. From reports received by the Commonwealth Relations Office here, it appeared that about 250 soldiers of the Uganda Rifles had mutinied at Camp Jinja on Lake Victoria and were holding their British officers and noncommissioned officers. The Ugandan soldiers also held the Minister of the Interior, Felix Onama, when he went to talk with them about pay increases, which seemed to be their main grievance. Prime Minister Milton Obote declared in a statement tonight that the increases had been granted and that Mr. Onama was returning to give him a report. The statement asked the people not to panic and asked that offices and shops open tomorrow. The British troops were requested as a precaution, the statement added, and it will not be necessary to have their services for long. Uganda is the third former British possession in East Africa to be the scene of an upheaval in the last 11 days. The British troops flown into Uganda tonight had been on alert because of the mutiny of two battalions of the Tanganyikan Army Monday and Tuesday. Additional British forces have been patrolling the East African coast since the Government of newly independent Zanzibar was overthrown last week. Sir Alec Douglas‐Home, the Prime Minister, summoned his service chiefs and the Cabinet's Defense and Overseas Policy Committee to 10 Downing Street tonight. An appeal for military help had been received from Prime Minister Obote. Half an hour later a promise of British help was given, and within 45 minutes of Mr. Obote's request seven military aircraft were carrying British troops to the port of Entebbe on Lake Victoria, south of Kampala, Uganda's capital. Four hundred British soldiers two companies of the Staffordshire Regiment and one company of Scots Guards —landed at Entebbe. They were assigned to guard the Entebbe airport and “certain other important installations,” according to a dispatch from Gen. I. H. Freeland, commander of British land forces in Kenya. Another company of the Staffordshire Regiment was aboard the British frigate Rhyl, in the Indian Ocean, patrolling the troubled East African coast between Mombasa and Dar es Salaam. The destroyer Cambrian and the aircraft carrier Centaur, with 600 Royal Marine commandos aboard, were also in the area tonight. At Moroto, where the remaining battalion of the Uganda Rifles is stationed, there was no report of trouble. Moroto is about 200 miles north of Kampala, near the border with Kenya. In all, 22 British officers and 16 noncommissioned officers are serving with the Uganda Army. Like the Tanganyika Rifles, which mutinied this week over pay and slow advancement, the Uganda Rifles are an outgrowth of the King's African Rifles, which was the British force in East Africa before the area attained independence. Uganda, Tanganyika and Kenya make up a huge East African section set apart from the rest of the continent by the Rift Valley. Sprawled around the point where the three countries join is Lake Victoria, the largest of the great African lakes. Uganda, with an area of 93,981 square miles, is the smallest of the countries, about as large as the British Isles. It was a British protectorate from 1890 until it became an independent member of the Commonwealth on Oct. 9, 1962. Although 13,600 square miles of Uganda's territory is covered by Lake Victoria, the value of her cotton and coffee exports still comes to about $100 million a year. The population exceeds 6.5 million, of whom about 10,000 are of European ancestry and 76,000 of Asian ancestry. The rest are Africans who speak Swahili or Bantu. NAIROBI, Kenya, Jan. 24—A barracks revolt broke out late tonight in Kenya's armythe third such flare‐up this week in East Africa. The unrest, which followed army uprisings in Tanganyika and Uganda, came while Britain was rushing troops and other forces here. Military sources said the mutiny was over the amount of pay received by African soldiers. Dissatisfaction over low pay was a cause of Monday's army mutiny in Tanganyika and yesterday's strike by soldiers in Uganda. The Kenyan troops, according to first reports, mutinied at a camp near Nairobi and at Nakuru, 100 miles northwest of the capital. The mutineers were members of the Kenya Rifles, the country's 2,650‐man army. Elements of the British Royal Horse Artillery were sent to Nakuru, headquarters of the 11th Battalion of the Kenya Rifles. They seized the armory, which the mutineers had invaded to get weapons and ammunition, and an officers' mess, where British officers and men attached to the African unit had gathered. One African soldier was killed and one wounded. An African riding past on a bicycle was wounded. Late reports said the situation at Nakuru was under control but was tense. Within minutes of the mutiny at the camp at Langata, three miles west of Nairobi, British troops fanned out to strategic points in the city. 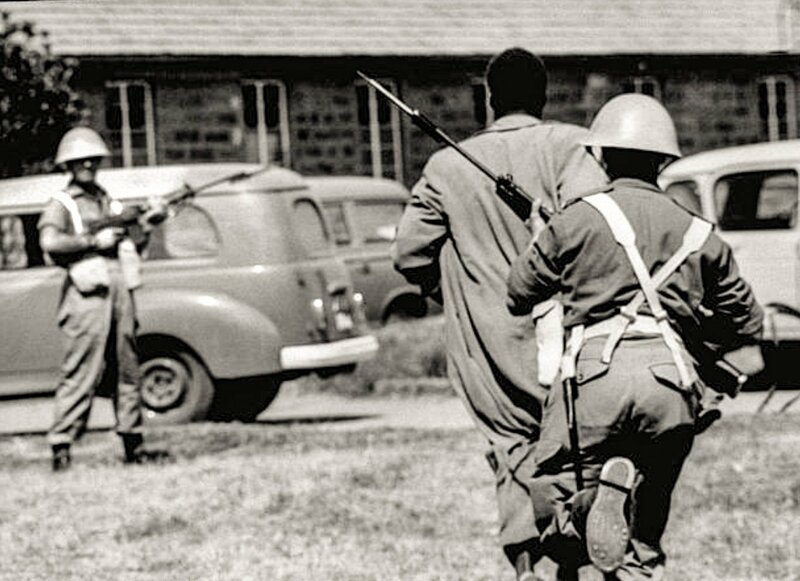 They blocked off the radio station, the telephone exchange, the overseas cable office, important government buildings and Embakasi Airport, East Africa's major international air terminal. More than 2,100 British troops were involved in the build‐up designed to guard against further insurrections in East Africa. The build‐up was in response to a request for help from Prime Minister Jomo Kenyatta. The build‐up included British land, sea and air forces. As darkness fell the Royal Navy carrier Centaur reached Kenya's Indian Ocean port of Mombasa. The carrier had aboard 600 Royal Marine commandos and an unspecified nunmber of jet aircraft. In addition, 700 British commandos were on their way in an airlift from Britain with 75,000 pounds of equipment and 20 vehicles. Four British warships, in‐ cluding the Centaur, were lying off Kenya and Tanganyika. The others were the frigate Rhyl, the survey ship Owen and a destroyer as yet unidentified. A United States destroyer, the Manley, also was lying offshore. The Manley had rushed to the area from Mogadiscio, capital of Somalia. About 120 members of the Staffordshire Regiment in full battle dress were taken off the Rhyl and flown to Nairobi, the staging area for the build‐up. Kenya announced, meanwhile, that she would increase her own army by 1,000 men in a recruiting campaign to start within a few weeks. The request for British military help was the second in two days. Prime Minister Milton A. Obote of Uganda called in British troops based here last night to protect his country's airfields, communications and other strategic services. He acted after about 350 members of the Uganda Rifles based at Jinja had detained their British officers and Uganda's Minister of Home Affairs. The minister, Felix Onama, was held in a guard room for an hour by the troops, who were “striking” for higher pay. The two countries requested British help under agreements reached when they became independent of Britain. Uganda became independent in October, 1962, and Kenya last Dec. 12. Mr. Kenyatta announced his plan for increasing the army after meeting with the British commander of Kenya's troops, Maj. Gen. Ian H. Freeland. He said he would establish a committee to examine “certain anomalies” in the pay of Kenya's African soldiers. The committee is to report back to him by March 1. The slow promotion of Africans and low pay were responsible for a mutiny of about 1,350 men of Tanganyika's army on Monday. They were incensed because British officers still commanded their units two years after Tanganyika had gained her independence.